The Tahoe City Transit Center on a quiet afternoon on Nov. 30. Developers looking to build on the Lake Tahoe side of Placer County will pay more in traffic mitigation fees beginning Aug. 28 thanks to a recently approved update to the Capital Improvement Program. The board of supervisors voted on June 27 to raise the fee, which pays for projects intended to offset increases in traffic volume. The increase will bump the current fee of $4,986 per dwelling unit equivalent to $5,540. 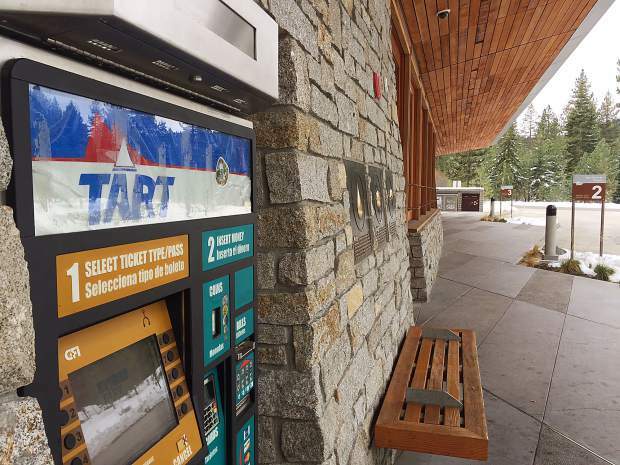 “I am looking forward to working with the community and county staff to help identify smart solutions for how North Tahoe moves, preferably by public transit, bicycle or on foot,” said Board Chairwoman and District 5 Supervisor Jennifer Montgomery in a statement. The program identified $35,495,400 in projects that would be paid for by the fees, but the existing rate created a $25,186,446 shortfall of that goal. The traffic fee increase on the region’s remaining 4,630 dwelling unit equivalents is intended to cover that gap, according to a memo from the meeting. Projects include bicycle lanes in Kings Beach, Tahoe Area Regional Transit bus stop enhancements, as well as transit vehicles, traffic operation and intersection improvements. Information from the county said the program has a renewed focus on public transit and paved paths for walking and bicycling, but that during the meeting concerns were raised regarding widening State Route 267 between Truckee and the Lake Tahoe Basin. Montgomery, the lone supervisor representing the Lake Tahoe region, said she doesn’t support road widening because it does not decrease the number of cars on the road. The number of vehicle miles traveled, both within and just outside of the Lake Tahoe Basin, has been a common concern raised each time a new development is proposed because of the negative impacts vehicle emissions have on the lake and its surroundings. With the increase, the Lake Tahoe region has the second highest traffic mitigation fee of any district within the county. Granite Bay has the fee, at $6,341 per dwelling unit.